The word Psoriasis is a Greek word. It is made from the two words. Psora and lasis. Psora means itch or scale and lasis means condition. Psoriasis is an inflammatory condition of the skin as well as of the nails. It is characterised by the patches of thick, red skin covered with silvery scales that occur primarily on the elbows, knees, lower back and scalp. It is not a life- threatening disease but painful enough to cause psychological and emotional distress. Psoriasis occurs when the immune system mistakenly recognises skin cells as the pathogen and therefore sends faulty signals that speed up the growth cycle of skin cells. According to Master Charak, there is an involvement of Vata and Kapha doshas in psoriasis. Accumulation of toxins or ama is the another factor which leads to the diseased condition. Kitibha is a type of kshudra kushts described in various Ayurvedic classics. It is a Vata-kaphja type of disorder. The clinical symptoms of Kitibha described in Ayurveda resembles with the clinical symptoms of Psoriasis. It is one of the most common skin problems of unknown etiology. It is a chronic, genetically determined, inflammatory and proliferative disease characterised by dry, well-circumscribed, silvery scaling papules and plaques of various sizes with spontaneous remission, relapse and seasonal variation. These lesions appear as silvery scales. This condition affects 2% of the population. Various races and communities differ in the susceptibility of this disease. Psoriasis like other diseases is the challenge to the medical science. In modern medicine, there is no definite treatment for this disease. The medicines that are available to treat the disease are not very effective and cannot be used for long term management because of their local and systemic side effects as well as toxicity. Suppression of vomiting, urinary urge etc. 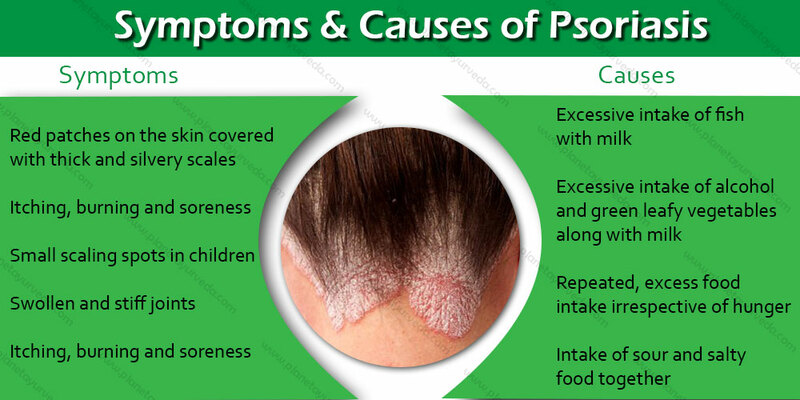 Psoriasis can be cured by Ayurvedic medicines as well as home remedies. Medicines that are used in Ayurveda are safe and being practiced since thousands of years. A large number of drugs are described in Ayurveda for the treatment of Psoriasis. Ayurvedic treatment for Psoriasis involves the pacification of the aggravated doshas and bio-purification of Ama at the cellular level like internal toxic metabolite and accumulated metabolic waste products. By virtue of ayurvedic treatment and home remedies, body cells become clean, healthy and viable. Take 1-2 cup of bitter gourd juice on an empty stomach in the morning. Continue this remedy for the period of 5-6 months. Lime juice can also be added if there is difficulty in digesting the bitter taste. Take 15-20 sesame seeds and soak them in a glass of water. Keep it overnight and drink on an empty stomach in the morning. Aloe vera is a wonderful herb for skin. Cut a piece of aloe vera leaf and peel it from one side to expose its gel. Rub this gel over the affected area 2-3 times a day. It is an effective remedy for the treatment of psoriasis. Turmeric not only heals the wounds and infections but it also cures skin diseases as well. Add some water to turmeric powder to make a paste. Apply this paste over the affected area 2 times a day. This remedy will effectively cure psoriasis. Take 1 litre water in a bowl and add some quantity of baking soda into it. Soak a towel in it and wash the affected area regularly. Do this remedy regularly. This powerful oil can be used over most topical and allopathic creams or lotions. Gently massage with coconut oil on the itchy areas of the affected skin. This oil moisturises the skin and also prevents redness and itching. Neem is a very useful herb for psoriasis. Crush the neem leaves to make juice as it purifies the blood. Take 20-30 ml of neem leaves regularly. Mix 3 flours flour of orange lentil (masoor daal), fenugreek (methi) seeds and green gram (whole moong) powders in equal proportion. Sieve the mixture and store it in an air-tight container. Soak 3 teaspoons of this mixture in water for 5 minutes and then use as body scrub instead of soap or body wash.
Avoid acidic or sour foods, citrus fruits like: lemon, oranges, apples, mangoes, tomatoes, pickles, curd and buttermilk. Avoid fruit jams, preserved juices and canned foods. Avoid all the fermented food and all bakery items. Do not consume all kinds of milk shakes and milk should not be consumed after eating fruits for half an hour. Avoid green chillies and red chillies. Include lettuce, turnips, spinach, broccoli, coconut water in the diet. Eat a diet that is full of healthy fats such as avocados which are rich in omega 3 fatty acids and proteins which facilitate the growth hormones in the follicles. Apply banana leaf over the affected area. Applying mud-packs is another a very safe and natural method for psoriasis. Psoriasis can be triggered by stress, both physical and emotional. Meditation and Pranayam should be practised regularly to avoid stress in day to day life. Previous articleHiring a Personal Trainer – A Blessing or an Affliction?